For any requests to add, move, or remove bus stops or amenities at existing bus stops, or any other operational or safety/security issues related to the stop location, please contact busstops@omnitrans.org. When a local jurisdiction (city or county) begins the process to create or update a general plan, specific plan, or roadway project, or to review a development proposal, there is an opportunity to incorporate transit into the planning process. It is recommended to include a transit element in community general plans, with information such as proposed bus routes, transit centers, and planned sbX BRT corridors. Contact and coordinate with the public transportation agency, Omnitrans, on bus stop design prior to final building permits of any bus stop being constructed as part of this development. Additional guidance for bus stop construction specifications can be found in Omnitrans Bus Stop Design Guidelines document. 1.1: Continue to consult with regional transit operators to maintain and improve the coverage and frequency of transit service in the City. 1.2: Consult with Omnitrans to establish and maintain transit hubs at key locations throughout city, both existing and planned. 1.3: In addition to requiring private development to provide transit amenities, consult with regional transit operators to provide attractive and convenient bus stops, including shade/weather protection, seats, transit information, and bus shelters as appropriate. 1.5: Continue to require that the siting and architectural design of new development, infill or redevelopment projects promotes safety, pedestrian-friendly design, and access to transit facilities. 1.6: Enhance pedestrian and bicycle access to local and regional transit, including facilitating connections to transit. 1.7: Continue to design and operate arterials and intersections for the safe operation of all modes of transportation, including transit, bicyclists, and pedestrians. 1.8: Continue to require that new development participates in the cost of transportation mitigation and improvements necessitated by new development, including non-automobile solutions. 1.9: Require that new and substantially renovated office, retail, industrial, and multi-family developments implement transit amenities, including bus turnouts, transit shelters, and other streetscape elements, as appropriate. 1.10: Require the future development of community-wide serving facilities to be sited in transit-ready areas that can be served and made accessible by public transit. Conversely, plan (and coordinate with other transit agencies to plan) future transit routes to serve existing community facilities. Identified transit streets in General or Specific Plans. Existing streets with transit routes. Projects that affect streets serving high density residential, commercial, industrial areas, or educational or medical institutions. Streets that would logically connect existing or planned transit routes or connecting areas which have or are planned to have transit service. Any other project that in the jurisdiction’s opinion should be assessed for current or future transit needs. Pedestrian routes to bus stops should be designed to meet the needs of all users (including disabled, elderly, and children). The pedestrian system should provide convenient connections between destinations including residential areas, schools, shopping centers, public services and institutions, recreation, and transit. Provide a dedicated sidewalk and/or bike paths through new development that are safe and direct to the nearest bus stop or transit center. Minimize the distance between buildings and the bus stop through proximity and orientation. This can be encouraged by including transit accessibility concerns in zoning policies, setback guidelines, building orientation guidelines, and parking requirements to encourage transit-oriented development. Buildings should be located with entrances from sidewalks, wherever possible. Minimize the use of elements that restrict pedestrian movement such as meandering sidewalks, walled communities, and expansive parking lots. Pathways should be designed so pedestrians traverse a straight, direct path wherever possible. Eliminate barriers to pedestrian activity. This includes sound walls, landscaping, berms, or fences which impede pedestrian access or visibility. If there is restricted access, gates should be installed at access points. Pave pedestrian pathways and ensure that they are accessible to everyone. Provide accessible circulation routes that include curb cuts, ramps, visual guides, signage (visual and Braille) and railings where needed. Place ADA compliant curb ramps at each corner of intersections. Adequate drainage should be provided to avoid pooling and muddy conditions. Provide street lighting along bus stop access routes and safety lighting at intersections to promote safety and security for transit patrons. Ideally bus stops should be illuminated by nearby street lighting; if not, consider installation of lighting at the bus stop. Click here to see the Design Review Checklist used by Omnitrans’ planners when reviewing developments to incorporate transit. Public Works and private development construction activities often impact bus operations and bus stops. The following information attempts to reduce construction conflicts, provide information for the contractor, and guide local jurisdiction staff coordinating both design and construction work with the private development community. Omnitrans considers construction coordination a local function, but is available to provide assistance if requested. Omnitrans will participate in any decisions on construction that requires temporary stop closures, relocations, or route disruptions. Provide the public transportation agency, Omnitrans, a written notification 5 days prior to any construction that will impede on nearby bus stop or service. Provide written notification to Omnitrans five (5) day prior to any road closures and/or construction detours that will impact a bus stop or service as a result of this development. Plans and specifications usually contain language requiring contractors to maintain pedestrian access and signage, etc. Notes on the construction plans provide instructions to contractors and construction inspectors. A minimum 4 feet wide walkway shall be provided to maintain passenger access to and from bus stops during construction. Temporary access to bus stop zones during construction shall be approved by Omnitrans in advance of construction activities. The contractor shall notify Omnitrans at least 5 work days in advance for all street closures affecting transit operations regardless of the duration of the closure. This will allow Omnitrans sufficient time to plan detours and notify the general public. The contractor shall work with Omnitrans to establish an approved temporary bus stop location. Omnitrans will provide and post the appropriate temporary bus sign signage. The contractor shall notify Omnitrans at least 5 days in advance of construction completion so that permanent bus stop signs can be re-installed by Omnitrans. Contact Omnitrans for coordination and review requirements. Contractor may not remove any bus stop signs without prior authorization from Omnitrans. All work shall conform to the requirements of the Americans with Disabilities Act (ADA) including provisions for temporary access to and from bus stops. Temporary access to bus stop zones during construction shall be approved by Omnitrans at least 5 days in advance of construction activities. The contractor is responsible for all costs incurred for loss or damage to bus stop signs, hardware, and street furniture. Project acceptance will be delayed at the request of the local jurisdiction for any damaged street furniture or non-payment of costs. Temporary removal of street furniture to avoid damage and conflict during construction requires a 30-day advance notice to both the city and the owner of the street furniture. The contractor is responsible for construction of the passenger boarding pad on which street furniture will be placed. The pad must be designed and located in conformance with local jurisdiction standard details. Any necessary deviations from standard details require the written approval of the local jurisdiction. The contractor shall receive approval from the local jurisdiction for the location of street furniture placement prior to construction of the passenger boarding area. 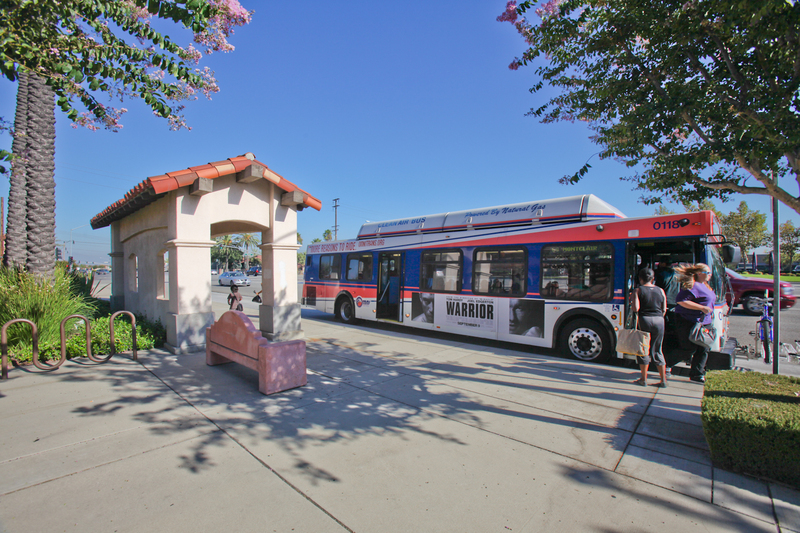 Prior to final acceptance or release of certificate of occupancy, the local jurisdiction must be notified to inspect and approve all bus stop related improvements. A minimum of 48 hours advance notice to local jurisdiction and Omnitrans for final inspections is required. Contractor shall provide Omnitrans with the name and telephone number of the contractor’s construction manager prior to the commencement of all construction projects involving bus stops or bus route detours. Contractors shall make every effort to schedule their work to minimize impacts and the duration of impacts to transit operations and the general public. The contractor is responsible for the construction of the passenger boarding area. A representative of Omnitrans should be invited to the project’s pre-construction conference.